Hello and welcome to part two of my tour as Paul and I headed on into Wales and onto the Victorian Festival in Llandrindod Wells. It was quite a journey from Falkirk but we had all day Sunday for driving and we arrived about 9pm. Our first impressions was Llandrindod Wells looked a bit like a Victorian seaside town only with-out the sea and then the penny doped ofcourse think Spa as the clue was is in the title with Wells! Me at The Pavillion Theatre! 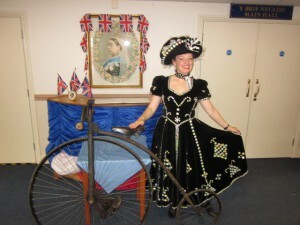 Me with a Penny Farthing! ith Ladies Choir who came in spontaneously with so many of my songs. It just goes to show you can’t beat a good tune! 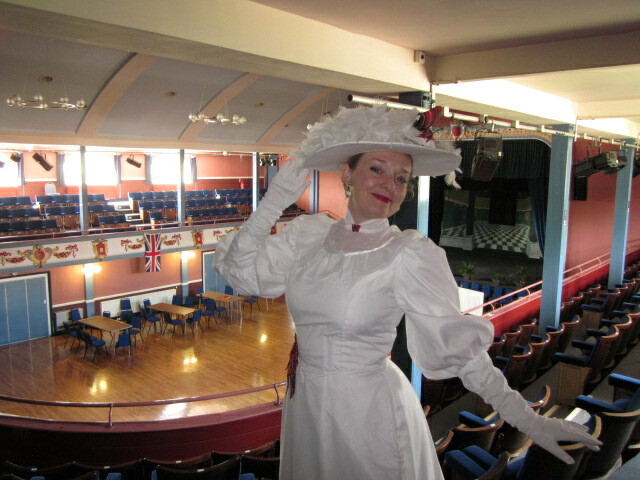 On Tuesday I was singing on the band stand and performed in my Bustle, Burlington Bertie and Pearly Queen costume. 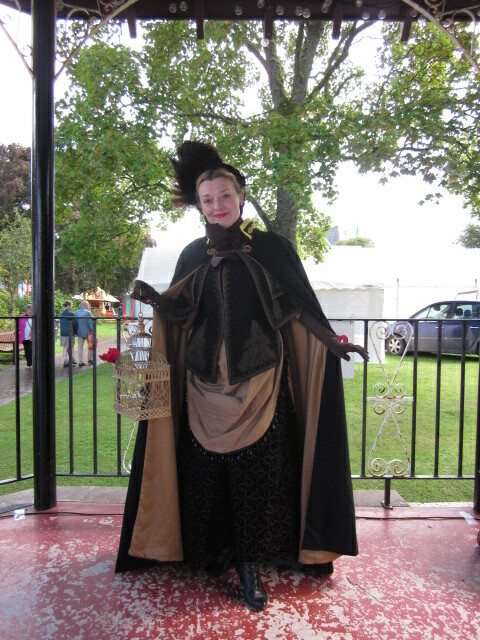 Sadly the wind started to pick up but thanks to dashing Hassar Steve who lent me his cloak all was well. I’m so pleased the theatre allowed me to use their dressing rooms which made life so much easier. After our last show on the Tuesday Paul took over the driving and we were home by 11pm. I’m back now until the weekend as I have two shows to do on Saturday. The first being an ATS one at the Drayton Parslow Fate and the second a Pearly Queen show for a private party in Bracknell. Since returning I’ve had shows every day which will be takeing me through to the end of the month. This morning I had a meeting with Rachel my web-designer and I’m pleased to announce we have now added a new credits page to my web-site. We have also refreshed my 1940s page adding in all my 1940s related videos which makes viewing much easier. So if you do get the chance do click onto my pages and take a look. Thant’s all my news for now. Thank-you for following and Toodle Pip!